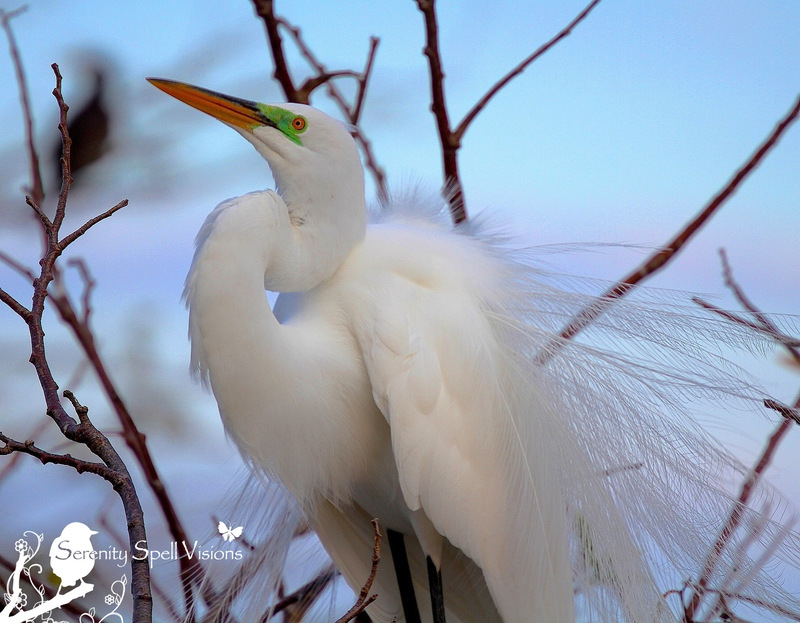 The Great egrets of South Florida’s wetlands have been putting on the most wondrous displays in the rookeries. Appropriate timing for Valentine’s Day…. It’s hard not to think that I should be trying a wee bit more, after observing such grand shows of attracting mates. 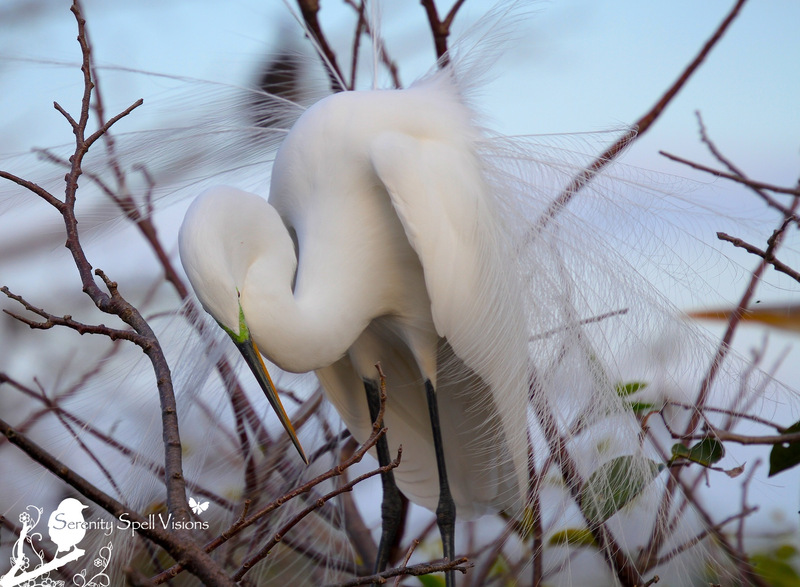 Breeding Great Egret, Florida Wetlands: Check me out. 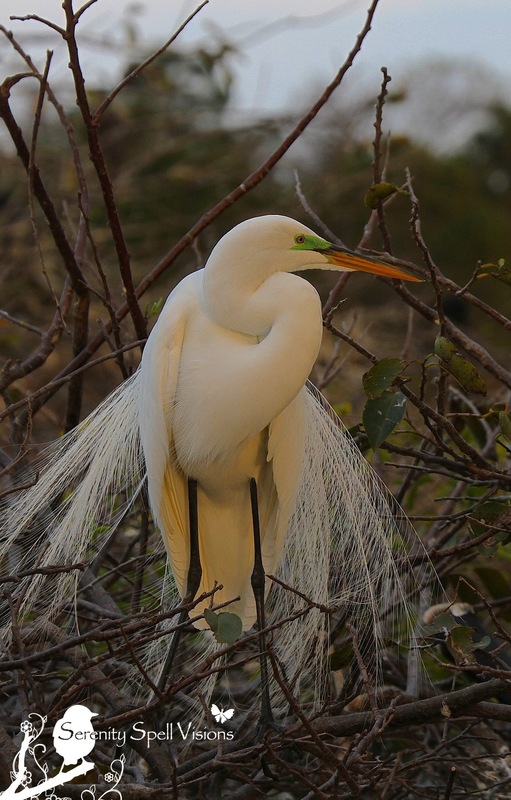 The feathers of the Great egret are stunning, almost unreal; sadly, these beautiful birds were hunted mercilessly — nearly to the point of extinction, their numbers decimated by 95 percent — towards the end of the 19th century. Their breeding plumage was especially prized, and their treasured feathers were used in hats across the globe. With conservation measures enacted, their numbers grew throughout the 20th century. While wetland habitat loss is once again threatening their existence, these birds have a high adaptability to human habitation. Of course, the loss of wetland ecosystems remains another issue altogether. The setting sun has nothing on me…. 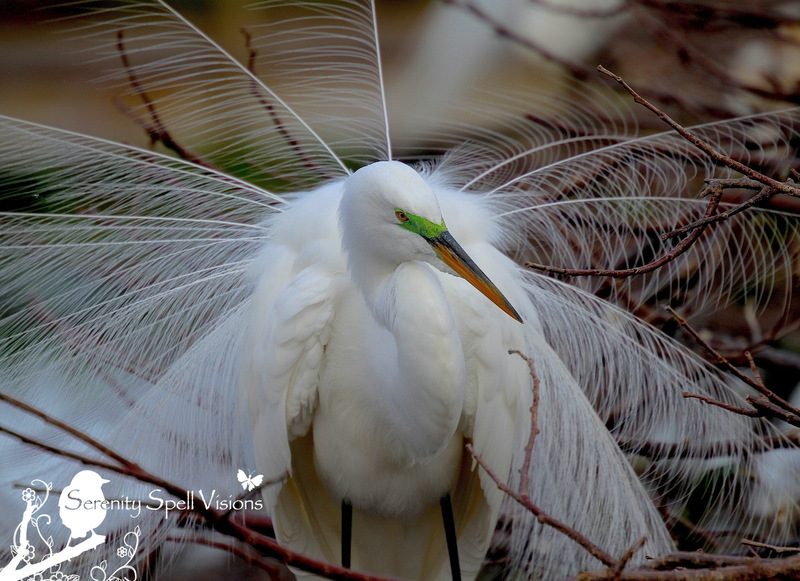 During the breeding season, the Great egret displays long, elegant plumes on its back, which are used in courtship displays. Like a peacock, these feathery plumes spread out like a fan. 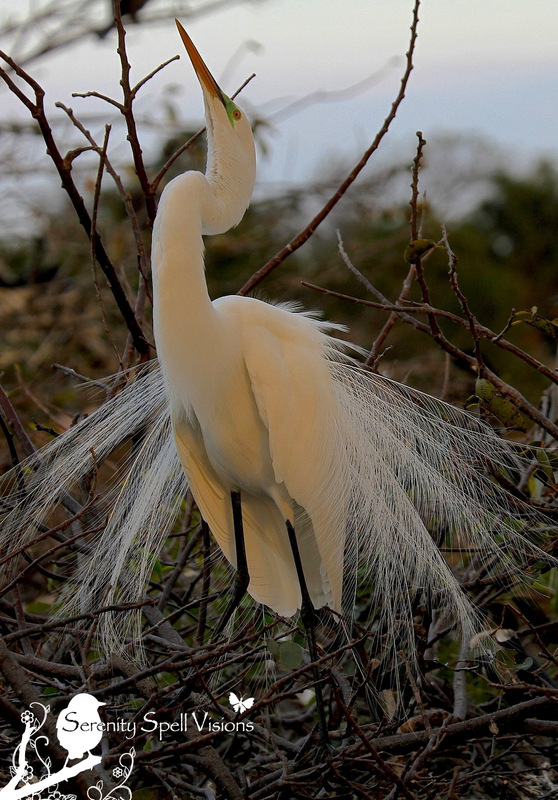 (Outside the breeding season, these long feathers disappear.) During this time, the lore (the area between the bill and the eyes) may turn vibrant green. Nature’s colors are brilliant…. 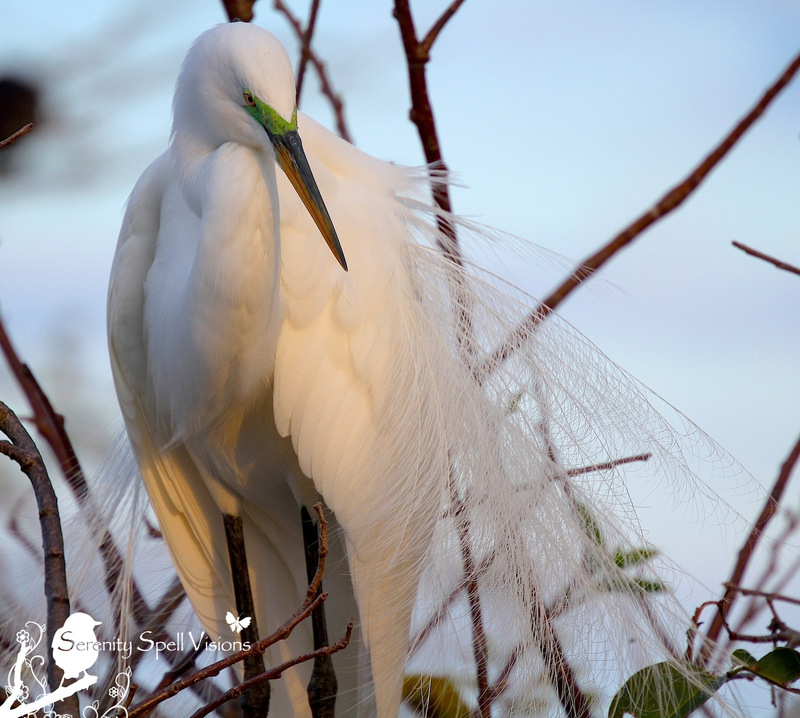 The male Great egrets will choose a specific display area, which will later become the nesting site. 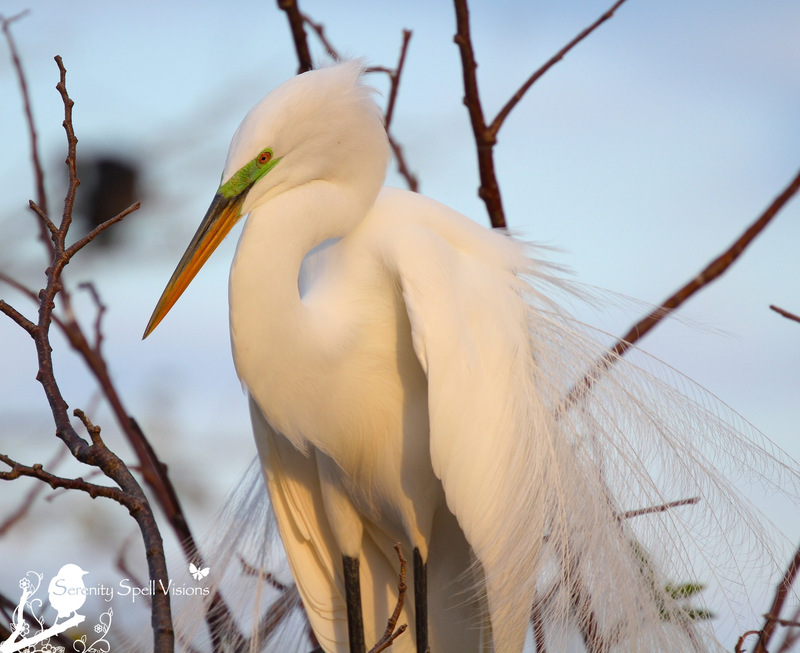 Nests are usually over water, far off the ground — high in the rookeries, as in our area. He (HE!) builds the nest with long sticks and twigs before pairing up with a female, at which point they both work to complete the nest — although it’s usually the male who finishes it. Shake it. Shake it like a Polaroid picture. And the final stage of the display, the reach…. By “trying a wee bit more,” do you mean adding color to your person?! <:-D That will surely be Part 2 of this The Show! –L. Hee…. Well, I haven’t put the blue back in my hair yet — perhaps it’s time!!! You’re so very right — green lore, blue hair — what’s the difference? I hope you do it, FG. A gift to yourself of fun! Enjoy the thinking and planning, Girl, and then whatever comes next. So beautiful! I love this time of the year when the birds put on a show. I feel so boring in comparison! They’re incredibly lovely on a normal day, but now…. Wow. You really capture not only the elegance, but also the “personality” of these incredible creatures…(I think we need a new word for that…something not quite so human-centric). Anyway, they are marvelous photos! Thanks so much for sharing! Thanks so much for your kind words! It’s hard to do this beauty justice… It’s just phenomenal. Especially now, of course, during their primping times! 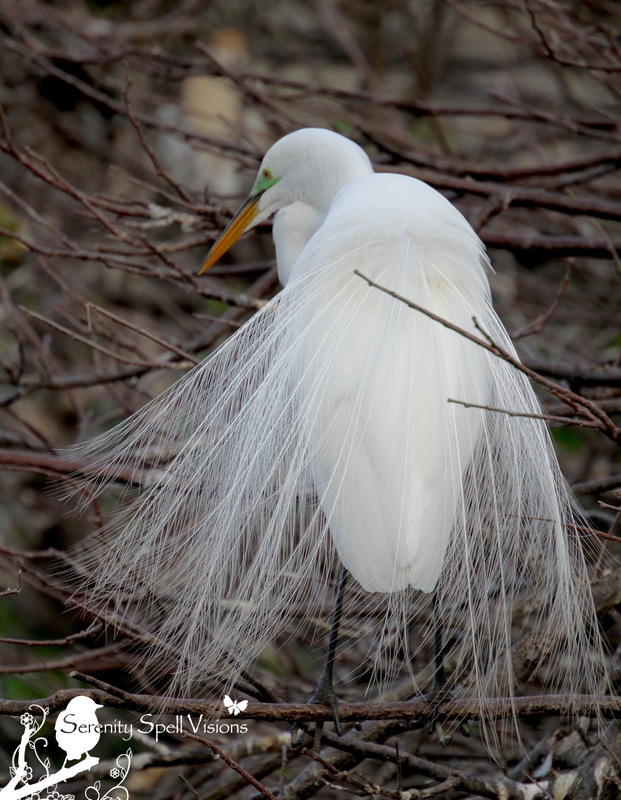 I’ve seen many egrets, but never one in breeding plumage. Thanks for sharing those! Ah, really? It’s a sight to behold. I hope I did them justice…. It’s just phenomenal. As many times as I’ve witnessed it, I’m still entranced by their beauty and displays…. I would love to witness it in person, but I’m not sure that they breed here in Michigan. According to the “All about birds” website, they don’t, but I see them often, so I don’t know. I thought your photos were about the best that I have seen of them in breeding plumage. Thanks so very much — it’s easy to capture their beauty!! Beautiful lighting! I was admiring these beauties today! Ah, thanks…! The setting sun can be tough, but sometimes works. 🙂 They’re just amazing…. What a beautiful show those feathers and your pis were!!!!! Thanks so very much! I never tire of these guys… And when this season arrives, I’m totally entranced by their beauty!! Thank you so much for sharing these with us. Easy to see why this species became the symbol of the Audubon Society. Outstanding photos of those marvelous birds! I just cannot comprehend harming one for its feathers! Thanks so much! Honestly…. Can you imagine? And to the numbers that they were killed, nearly totally wiped out… just until recently (in the historical perspective, anyways). It’s unfathomable. Wow – these shots blow me away. What gorgeous feathers they have! Thanks so much! Aren’t these guys amazing? They’re gorgeous on a normal day… But during this season, WOW. As many times as I’ve witnessed it, I’m still entranced. What a great show! Amazing! love all the photos! A beautiful bird, but FANTASTIC photos! Thanks so very much!! It’s pretty hard not to take amazing shots of these guys, during this season…. They’re simply out-of-this-world!! Can’t fool me, they are remarkably beautiful birds but there’s some skill and a good eye behind that camera. These graceful creatures are always a delight to watch during the mating season!! I love the presence of the aigrettes and that bright green lore the have during this time. Terrific photographs of this lovely bird! Ah, thanks so very much! I was thrilled to be visiting the wetlands — and then the ‘glades watershed — while these guys were putting on their most amazing and beautiful displays. As many times as I’ve seen it, I’m still entranced. Just heavenly. These plumage displays are brilliant, I’ve yet to see one fan its feathers like you’ve done here, it’s a spectacle! It is really fantastic to see this show, Fey Girl. WOW – I HAVE NEVER SEEN SUCH AN INTERESTING BIRD. IT LOOKS LIKE SHE IS WEARING A WEDDING DRESS. THANK YOU VERY MUCH!! Ah, what a perfect analogy!! They’re just heavenly, aren’t they? Every time I see them, I’m entranced. I was mentioning to Judy how marvelous it is to see her photos of the nesting Great Blues – I’ve never seen that. And now, to see this! My goodness. There’s nothing to be said the others haven’t, except to repeat how much I appreciate your going to the effort to share this world with us. Even though you enjoy it, it IS work – and we all know that! Now, here’s a question. 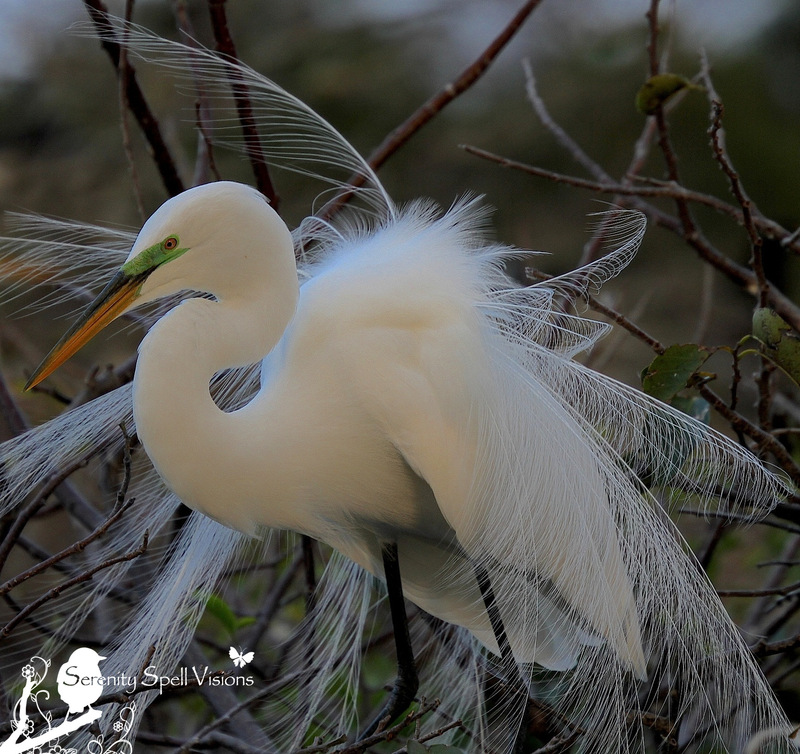 Where do these wonderful feathers go to, post-breeding season? I’m a found-feather person, and it’s really quite interesting. I’ve only found one cardinal feather in my life. Black-crowned night heron feathers are relatively common. Do these birds lose their feathers, or does their nature change and they just become boring old standard-issue feathers? Sometimes what we don’t see in nature’s as interesting as what we do see! Ah, you’re so very kind….! And you’re right — as much as I love doing this, sharing this amazing, unique world — sometimes it does take a bit, eh? OH YES!!! I’m totally a found-feather person, as well!! (Just yesterday…ooooh I’m so excited…I found a feather under my office [home] window. Won’t say what b/c it may be a “special” feather.) I find ALL kinds of feathers on my hikes… At my desk, I have blue jay, “special” large feathers (wink, nod), wading bird feathers, and yes — feathers from these guys, from their breeding plumage! ALL FOUND, guys. Since their time is mainly spent in the rookeries above water, it’s safe to say many of these feathers fall into the wetlands. But yes, they do lose this beautiful breeding plumage. Spectacular photos! 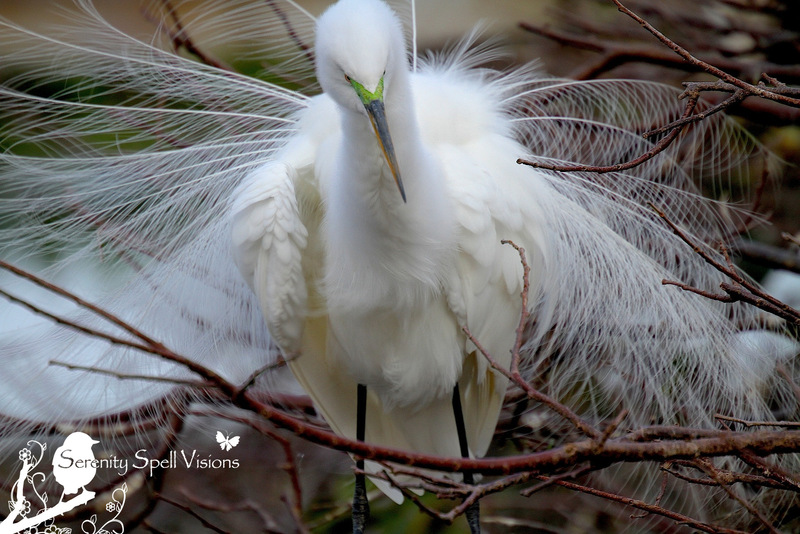 I hadn’t realized they have such ethereal wings–the egrets out here in California, at least the ones I’ve seen do not have that. This is their breeding display… Perhaps they migrate a bit more south for their breeding, so you’re not seeing such plumage? It really is quite a sight. As many times as I’ve seen it, it’s breathtaking. Stunningly beautiful. 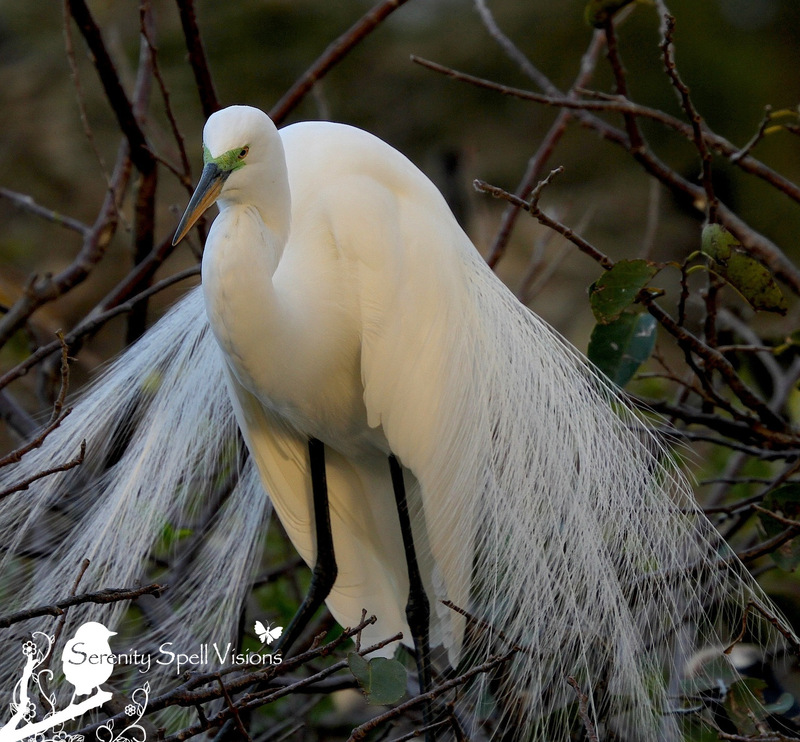 We get to see egrets here during migration, but since they breed elsewhere I’ve never seen the green lore and the beautiful breeding feathers. They’re just fantastic. They’re just amazing…. As many times as I’ve seen the display, and brilliant coloring, I’m still in awe. It’s truly awesome — a real spectacle! OMG, this bird — and your camera eye — is breathtaking. Beautiful. Aw, thanks so very much! As many times as I’ve seen the display…. I’m entranced. It’s pure magic. Beautiful photos Christie! Love how the feathers get so delicate. Thanks for liking the Ansel Adams post. If you go to our facebook page (which I hope you like) you’ll see a fantastic photo of a young AA. So handsome! You’ll also find a surprise visitors to the poolside of our Thekkady property Cardamom County. See you there! Thanks so very much! They’re AMAZING feathers — I actually found one last year (they’re hard to find, b/c their nests are over water). So beautiful, angel-like. Yes! I found a few when we were working in Baja California Sur so I have them in the “feather bouquet” that I keep. I’d really appreciate it if you’d “like” the facebook page when you get a chance. We’re trying to expand our reach. Thanks! These are absolutely stunning captures. I bet when you were watching these beauties in all their glory that you were just mesmerized. TOTALLY…. As many times as I’ve witnessed this display, I’m in AWE. Just yesterday, in fact — same thing! It’s completely mesmerizing. SO incredibly beautiful. Otherworldly. I think some creatures just know they’re beautiful. SO very true…. Every time I see this display, I think just that. it’s so amazing and fantastic!! Well done!! Thanks so very much! I’m always in awe of their displays, as many times as I’ve witnessed them… Pure magic!